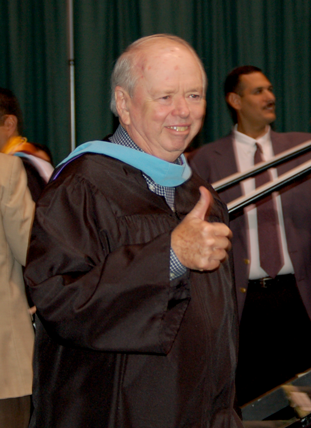 Mike Allen, District 3 Representative on South Texas College’s Board of Trustees, passed away on Wednesday, August 25. Serving on the board since May 2004, Allen represented the interests of the constituents of south McAllen, southwest Pharr, Hidalgo, Sharyland, southeast Mission and Granjeno. Allen recently completed a term as chairman of the college’s board, and won reelection to his seat in May 2010. During his tenure on the board, Allen contributed to the accomplishment of milestones that have helped the college grow to serve more than 27,000 students across Hidalgo and Starr counties. Under his leadership, STC has grown to offer more than 100 degree and certificate program options from its five state-of-the-art campuses. “Of the many responsibilities Mr. Allen and his fellow board members have had, none have been as demanding as the construction program implemented by the college, which saw 16 buildings completed in 16 months at five locations, and completed on time and within budget,” said Dr. Reed. His shared vision has allowed STC to become a thriving intellectual and community center, hosting art lectures, business luncheons, congressional briefings, visiting authors, and many other events enriching the lives of community members. Because of his leadership in regional economic development, Allen spent much of his time on STC’s board pushing for new, innovative workforce training programs. He played an integral role in helping the college secure the necessary approvals to offer the Bachelor of Applied Technology Degree in Technology Management, and in Computer and Information Technologies. He oversaw the expansion of the college’s business and industry training programs to include precision manufacturing, engineering, import and export logistics, welding and diesel technology, to name a few. Additionally, Allen worked closely with college administrators to secure grant funding for workforce training in key industrial jobs needed to recruit new companies to the area including welding, industrial maintenance and computer maintenance. He was instrumental in helping the college establish the North American Advanced Manufacturing Research & Education Initiative (NAAMREI) to develop the nation’s only advanced, rapid response manufacturing industry. With his assistance, the project received more than $5 million in funding from the U.S. Department of Labor and $3 million in funding from the Texas Workforce Commission. Allen was a true believer that college begins in kindergarten. As such, he was a proponent of the college’s elementary school adoption programs. He also pushed for a innovative approach to dual enrollment, allowing high school students from the two counties served by STC to take college courses tuition-free. To date, more than 9,000 students take advantage of the program to earn college credit in critical subject areas like history, math and science, as well as in technical trades like precision manufacturing and automotive technology. The 2006 Border Texan of the Year, Allen supported the growth of the college’s scholars program by designating STC’s Valley Scholars Program as the beneficiary of the $46,689 raised from the award celebration dinner. Allen retired as the executive vice president of external affairs and strategic projects for the McAllen Economic Development Corporation in 2006. He was the founder and chairman of the Texas Border Infrastructure Coalition, which was formed to develop, advocate and coordinate solutions to economic development needs in a 19-county region along the Texas-Mexico border. He also served as a member of numerous organizations including the American Economic Development Council; the Mexican Chamber of Commerce; the American Chamber of Commerce; the Reynosa Maquila Association; the Texas Good Roads and Transportation Association; the Lower RGV Development Corp.; the Texas Marketing Team; CoreNet; the McAllen Citizens League; and the RGV Chamber of Commerce. In addition, he has served as a director of the Rio Grande Valley Council of Governments and as a member of the Governor’s Task Force on Management and Labor Relations. Mike Allen giving STC students a thumbs up at graduation.